A few weeks ago I shared with you the story of Santy Caraballo – a food service worker – and how his actions made a great impression on a young patient who was in our 5 East pediatric inpatient unit. The short version of the story goes like this: a five-year old girl had been in the unit for several days and unable to eat regular food. Santy heard her tell her mother she wanted a cheeseburger. On the first occasion for this young patient to eat a regular meal, Santy made sure it was a cheeseburger – even though it wasn’t on our breakfast menu. Both mother and daughter were touched by this gesture and Santy’s colleagues were likewise impressed – but not surprised. What Santy did for that patient, her family and our system was to create a “Wow!” moment, and his actions should be celebrated and encouraged. I believe these moments occur every day across our hospital system. Whether it’s the more than 150 great patient testimonials from our I am Well Because campaign; nurses on 4 East who held a movie night for a special patient ; or Dr. Andres Schanzer and his team who say yes we can to patients when other hospitals give them no other options. These are just a few examples of the incredible work our people do each day that are routine for them, but are highly impactful to our patients. If you have A “Wow!” moment story about one of your colleagues we want to hear it. In the coming days we will add an an inbox (wow@umassmemorial.org) where you can send these important stories. Please include the name of the person and unit creating the “Wow!” moment and as much detail as possible. We will highlight some of these stories in our upcoming blog posts. Stay tuned for further details. 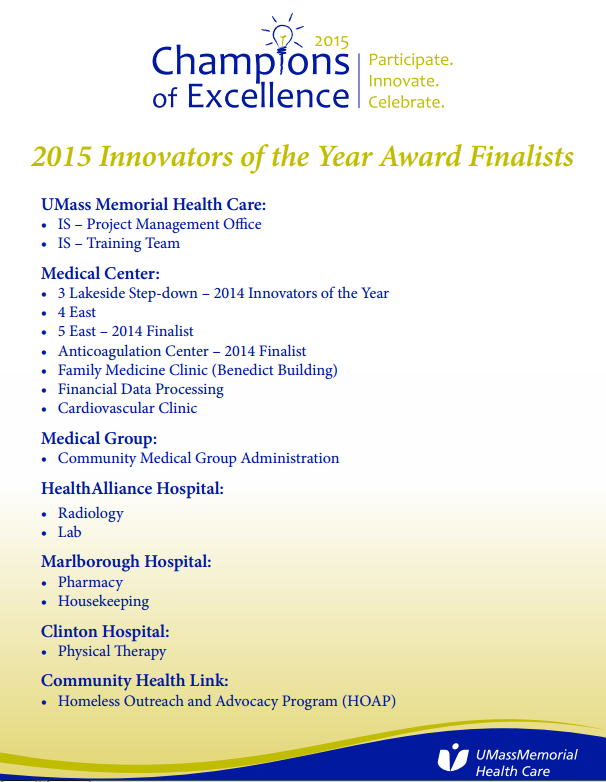 Congratulations to all of our nominees who’ve used their idea systems to continue to make this the best place to give care and the best place to get care. Show us your Salads Shifting gears, no one enjoys a good salad more than I do. The health benefits have been well documented, and if done right, they are also quite tasty. We currently have a campaign through our Wellness program that encourages our people to share their salad recipes. To participate and become eligible for our 2016 Simply Salads Calendar, please visit the campaign page and follow the entry instructions. Idea of the Week This one is from the Medical Center Transfusion Medicine team. The team manager Mindy Greene wanted to help find high school students work opportunities that promoted science in the workplace. Mindy and her team worked to create a partnership with Girl’s Inc. Eureka/STEM Program to provide an opportunity for a student to spend a month in the Blood Bank, Stem Cell Lab and Donor Center this summer. 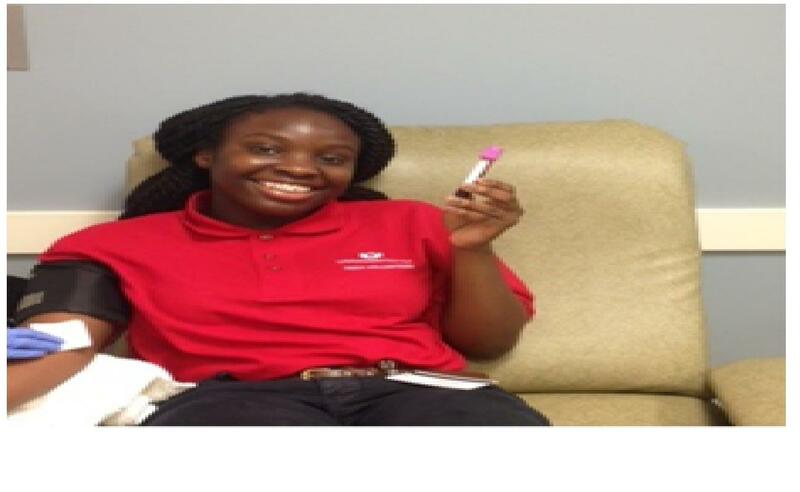 The high school student, Calista Amoah, had her blood drawn (with written parent permission) so that she could perform her own blood typing in the Blood Bank. “The idea was simple, we knew about the Girl’s Inc. Eureka/STEM Program from mailings we had received. We also know that STEM programs are popping up throughout the Commonwealth and that kids don’t have enough opportunity in science related activities. So we reached out to the folks at Girls Inc. last fall and solidified the commitment this summer. We wanted to give back to our community,” Mindy said. An added bonus for the student is the opportunity to meet with women in leadership positions throughout the organization who shared their personal and professional journeys. Well done! This entry was posted in Champions of Excellence, Employee Wellness, Employees, Media Coverage by Eric Dickson, MD, MHCM. Bookmark the permalink.